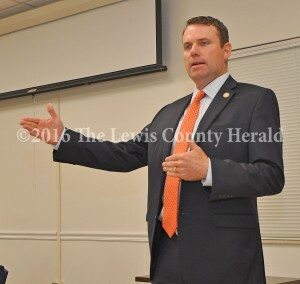 State Senator Steve West was the guest speaker for the Lewis County Chamber of Commerce for their regular meeting last week. West represents the 27th District which is comprised of eight counties, including Lewis County. He was first elected to the chamber in a 2015 special election following the resignation of Walter Blevins. In introducing himself, West said he is a cattle farmer and real estate attorney in Bourbon County.